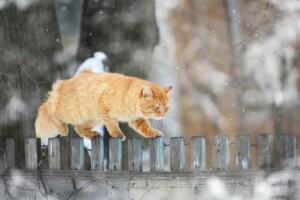 Winter Is Not Your Wooden Fence’s Best Friend! When the cold and snow of winter hits, don’t let your wooden fence suffer the damage. If you want to prepare your wooden fence for winter so that you won’t have to pay the price (literally!) when spring rolls back around, you’ll need to invest in a little routine care now. Read on to find out what some of the threats that your wooden fence will face this winter are and how you can prevent them. When the cold and snow of winter hits, don’t let your wooden fence suffer the damage. Snow exposes your wooden fence to a lot of moisture. However, unlike with summer rain, your fence won’t have much of a chance to dry out during the winter. Moisture build-up eventually leads to mold, mildew, and rot. This can be prevented by a good oil-based stain and periodically cleaning out the slots in your wooden fence from debris, leaves, and snow. The rise and fall of temperature causes wood to expand and contract. With extreme temperatures, this can happen at a rapid rate, creating knotholes. Choosing a strong, good-quality wood and protecting it with a good stain treatment is the best way to keep knots from occurring. As frost begins to thaw, it can cause the soil beneath your fence to shift, loosening your fence posts. This can compromise the entire structure of your fence. You’ll need to ensure you have had a quality fencing company install your wooden fence to be sure the posts are beneath the potential frost line. Keeping your cement footings free of debris and dirt can go a long way too by keeping additional moisture from eroding the concrete. Tree limbs can easily become overloaded with snow and break, falling on your fence and causing structural damage. Be sure to trim your branches before winter begins and keep an eye on the situation throughout the winter months. This entry was posted on Friday, September 18th, 2015 at 2:29 pm. Both comments and pings are currently closed.